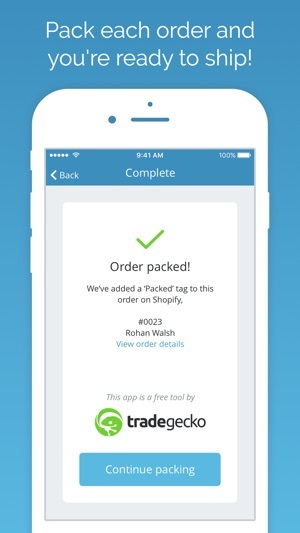 • Connect with Shopify to create pick and pack lists on iPhone and iPad. 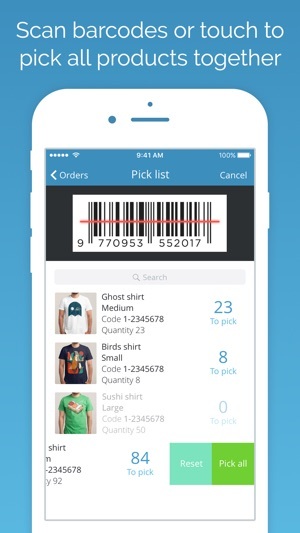 • Scan barcodes or touch to pick items for multiple orders. • Pack each order and get ready to ship! Pick Pack for Shopify is a free tool by TradeGecko to help you simplify your order fulfilment process. 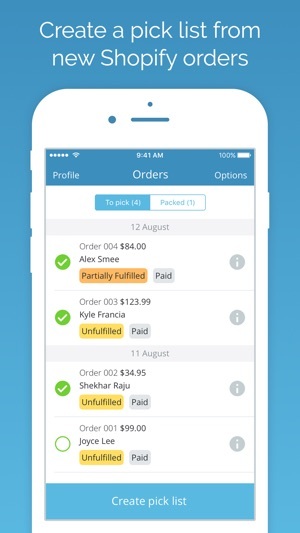 Sync with your Shopify store and see all outstanding orders to pick from your iPhone or iPad. After you pick and pack each order within our app, we’ll send the order back to your Shopify store tagged as “Packed”, ready to be fulfilled. Any Shopify store owner who manually picks and packs their orders! We have added support for the new iPhone XS / XR and now fully support iOS 12. Great way to pick and pack my Shopify orders. Amazing App! Just A Few Things To Make It 5 Star! First off, THANK YOU 🙏 so much for this extremely useful app! This app is a GOD SEND & A Must Have! Our store has over 300 products and we are easily picking and packing 50-100 orders and 200-400 items per day! I have enjoyed using it! I just beg that you, Please, Please, PLEASE keep updating it! Hell, Even CHARGE FOR IT! 😁 I would be happy to support the dev on this app if the things below were addressed and it is maintained. This is easily one of the BEST/most useful apps we own. 2) In regards to the Product Titles getting cut off. Our store sells many variations of a certain product so we could easily have “PRODUCT NAME” Keychain, “PRODUCT NAME” T-Shirt & “PRODUCT NAME” Sticker. In the event that “PRODUCT NAME” is more than a certain amount of characters the title gets cut off. This is fine if product images were to load all the way to the bottom and not drop off after a certain point because then we could visually see what variant of “PRODUCT NAME” we need to “pick”. 3) The app looked amazing on our IPhone 7 Plus, but we recently got the iPhone Xs Max and now there are gaps of black on the top and bottom of the app. Tbh, this is not even a big deal. If you only looked into 1 & 2, I would be extremely happy. But 3, shows that you guys are keeping up with the times. I truly, truly, TRULY love ❤️ this app! And would like to see these things addressed and even talk further about the development of this application. Would love to have an email address that you guys can be reached at. © 2018 TradeGecko Pte. Ltd.